Jonas Mekas credited Naomi Levine with bringing Warhol to his attention. 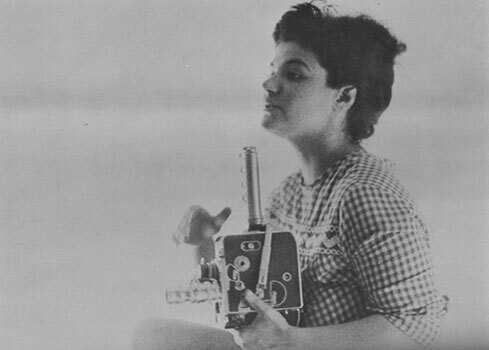 Mekas' Film-Makers' Co-op screened and distributed many of Warhol's early films. "I do not remember, strange as it may seem, but I could put it this way: In 1962, '63, '64, Film Makers' Cooperative was located at 414 Park Avenue South. It was much going, those years. It was a very busy period in New York in the Independent Film area, and the Co-Operative was the meeting ground for, ah, during that period, where the filmmakers stopped by during the day. During the evening, I was living there in the back of the Co-Op space. I gave the front of my space to the Co-Op - the front part was the Co-Op proper during the day. In the evening, it was a sort of night co-op, and during the evenings or afternoons, whenever a filmmaker felt that he wanted to show films to a friend or some[one], he could come in and screen. There was always projectors set up. And in the evenings, practically every evening, there was some little screenings... It was only that filmmakers knew and friends knew that, and this increased when we seemed to have at some films problems, censorship-wise, with public screenings. So, those films were usually screened by filmmakers and their friends at the Co-Operative. So, he's been there watching those films at the Co-Op, at my place, but I did not know that that was Warhol, as I did not know many other people. So, then, I think, I met him probaby at her place, and then, I recognized him. Yes, I have seen him there. It was Warhol. By 5 May 1965 Mekas was holding screenings at the City Hall Cinema on 170 Nassau Street. A Film-makers' Cinematheque ad in the 27 May 1965 issue of The Village Voice announced that the "Film Makers' Cinematheque is moving from City Hall Cinema to an interim location which is the ASTOR PLACE PLAYHOUSE, 434 Lafayette Street New York... Our first program at the ASTOR PLACE will be in honor of Kenneth Anger's visit to New York." The Anger films were shown on 28, 29 and 30 May. (Village Voice, 7 May 1965, p. 19). On 1 December 1965 the Cinematheque moved to the 41st St. Theater at "125 West 41st St. or 120 West 42nd St. - in between 6th Avenue and Broadway." (Village Voice, 25 Nov 1965, p. 20). In addition to the Kiss film and Tarzan and Jane, Naomi's other films for Warhol included Batman Dracula and Couch. Mekas interviewed Naomi Levine for his 24 December 1964 column. A copy of the interview can be found here. Mekas also edited and published the underground film journal, Film Culture. He included Naomi in the photo feature, "Stars of the 'New American Cinema'," in the Summer 1964 issue. It also included photographs of Andy Warhol on two pages. Naomi was featured on four pages.